Photograph taken at noon on October 29, 1948, in Donora, Pennsylvania. Courtesy NOAA Ocean Service Education. On a Sunday evening at the end of October 1948, famed radio broadcaster Walter Winchell took to the airwaves and alerted the nation to an emergency then happening in Donora, Pennsylvania. An impenetrable, toxic, and ultimately lethal fog had blanketed the steel mill center during the previous week and had silently infected its residents. Communication within the darkened town (which had no radio station, no hospital, eight doctors, two full-time firefighters, and three undertakers) was so bad that many of the 12,300 residents didn’t realize the extent of the tragedy until they began hearing from relatives and friends living outside the region who called in a panic. Within a few hours after Winchell’s broadcast, the chief counsel for American Steel and Wire, fearing the inevitable aftermath, reached the superintendent of the zinc works and told him to shut down the furnaces. 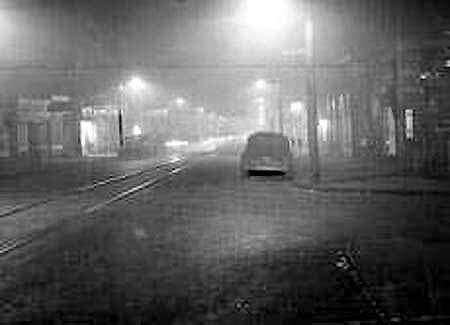 The most famous account of the Donora incident is “The Fog,” written two years later for The New Yorker by Berton Roueché, who remains one of the most esteemed writers of medical thrillers, a genre he practically reinvented during his fifty-year career. Roueché’s articles combined elements of several popular genres—true crime, detective fiction, suspense and horror—yet explained and explored with admirable accuracy the minutiae of science. His various awards reflect this balance: “The Fog” itself would end up being one of two pieces that together earned the 1950 Albert Lasker Medical Journalism Award, and his 1953 collection Eleven Blue Men, and Other Narratives of Medical Detection (which included “The Fog”) would garner a Raven Award, given for “outstanding achievement in the mystery field outside the realm of creative writing” by the Mystery Writers of America. Even today, Roueché’s books continue to inspire and thrill readers and authors. In a 2006 interview, the novelist Kaye Gibbons listed Eleven Blue Men as one of her ten favorite books, which “I reread every time I need to be reminded of the sheer joy possible in language and character. I like to think of him as the progenitor of CSI and give his books to friends whenever I find them in print.” And the television series House was in part inspired by Roueché’s works, according to the show’s producer David Shore. The Monongahela River rises in the middle Alleghenies and seeps for a hundred and twenty-eight miles through the iron and bituminous-coal fields of northeastern West Virginia and southwestern Pennsylvania to Pittsburgh. . . . If you don't see the full story below, click here (PDF) or click here (Google Docs) to read it—free! It seems jyothinatarajan has yet to read the actual story, because the cause of the illnesses was not a single chemical but a mixture of different chemicals emitted by the factories. And the fog WAS the pollution, it didn't compound it.